With white wine, generally speaking, a darker colour can indicate an older wine. White wines may go from pale straw, to straw, deep straw, pale gold, gold. A brownish edge at the meniscus (the curved upper surface of a liquid in the glass) could indicate some oxidisation, turning it rancid (meaning it could taste unpleasant as a result of being old and stale). Young reds look vibrantly violet-red, whereas older reds usually have a darker brick or duller red hue. Wine is composed of many different compounds, so the ‘nose’ or smell of the wine is usually quite complex and may invoke many smells that remind you of several things at the same time — our nose can detect over 10,000 different smells and can detect a concentration of any one smell as low as one part in 10,000. Swirl the wine around in your glass to aerate it. Swirling releases the wine’s volatile compounds and aromas. Notice how the wine ‘clings’ to the side of the glass. This ‘clinginess’ is known as the wine’s legs or tears. The wine clinging to the inside of the the glass after swirling can increase the surface area of the wine four to five times, allowing a greater release of the wine’s ‘smell’. If at first you don’t feel confident swirling, place the base of the glass on a flat surface and swirl this way. Do this perhaps only twice. While our nose may be our strongest sense, it tires quickly. As we mature in age, our sense of smell generally remains stronger than our sense of taste. Therefore, smelling is our most important sense when winetasting. Hold the wine up, preferably with a white background – even a serviette and piece of paper works if you’re not near a wall. is the wine clear or cloudy? are there any ‘chunks’ or particles floating in it? does the wine look clean? You are looking for a clear and crisp looking wine. Actually, these days it’s hard to find colour or clarity faults with most wines. what good things do you smell about the wine? is there a smell that does not appeal to you? If so, what is it? what do the various smells remind you of? This is a most important step — the wine should smell fresh and clean, not musty and stale. Initially, try to think of one smell (descriptor) that the wine reminds you of. Is it fruit? If so, what sort? Perhaps it’s flowers or berries? Remember these smells for when you next nose this wine or varieties like it. These ‘smell sensations’ may vary from person to person, yet some wines are universally unmistakable. For example, the intense passionfruit and tropical fruit aromas contained within Sauvignon Blanc. It is generally agreed that aroma is the smell of the grape variety in the wine, whereas bouquet is the overall smell for all that has happened to the wine during its creation. For example, the type of oak used etc. The nose is part of your palate, so once you have nosed a wine, then you taste. Your palate (mouth) should confirm what your nose told you. Remember, when you have a cold, you cannot taste properly. This is not because the cold has overtly affected you tastebuds, but rather that your retronasal passages (the airways that connect the nose and the mouth) have been temporarily affected by the cold. As our retronasal passages (the airways that connect the nose and the mouth) are used in conjunction with our tastebuds when we utilise our sense of taste, having a cold temporarily lessons our ability to taste. Take a sip (a small amount) of the wine and move it around to all parts of your mouth and tongue. draw in air through pursed lips to once again aerate the wine to release the volatile compounds. Noise is okay! How does the wine feel in your mouth? is it thin or watery? does it have a bit of thickness, body or weight? This is what’s called the mouthfeel of the wine. what else can you taste? Continue to experience the wine after swallowing or spitting to gauge its finish or lingering qualities. does it have a long or short finish? Savour the finish! Move your tongue around your mouth, and smack your lips together. Do the above Step 3 two or three times to get to ‘know’ the wine. Now it’s time to evaluate the wine. It becomes easier to do this while progressing through the previous three steps. You can omit the first step of looking at the wine — unless you wish to reconfirm some aspect of its colour or clarity. In your assessment of the wine, think of all you have experienced through the different steps in context with the following four aspects – F.A.A.S. Fruit – could you taste any fruit in the wine? This is desirable. What was it? Remember wine does not always smell like the grapes it is made from (Muscat wines aside). Alcohol – could you taste the alcohol, or was it well integrated and balanced with the fruit? 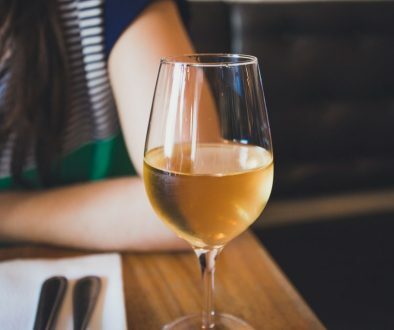 Acid – did the wine taste crisp, perhaps zingy or prickly in the case of some dry white wines, or was it flat and unexciting in your mouth? In the case of a red wine, could you feel any tannins* coating your cheeks and tongue etc. thus giving the wine its dryness? * Tannins are derived from the skins and seeds of the red grapes during initial fermentation. Drink a cup of strong black tea and you’ll also experience tannins. We don’t usually use bitter or sour when describing sweetness or non-sweetness of wine. Wines are usually classified as dry, medium dry, semi-sweet and sweet.